Comments Off on Reminder: Pre-registration for 2012 Field Crop Dealer Now Open! Reminder: Pre-registration for 2012 Field Crop Dealer Now Open! Please pre-register for the Field Crop Dealer Meeting online at http://nysaba.com/meeting_registration. The registration fee is $15. November 7-8, 2012 Northeast Greenhouse Conference and Expo at DCU Center, Worcester, MA. Join other growers and retailers for the largest nationally recognized floriculture industry show in New England! This biennial event is co-sponsored by New England Floriculture, Inc.,—a group of grower representatives from the Northeast, augmented by University and Cooperative Extension staff in each state who specialize in greenhouse crops and management. For conference registration or hotel reservation information visit: www.nysta.org or contact the NYSTA office at 518-783-1229; turfandgrounds@nysta.org. November 8, 2012 Basic Farm Business Management Planning 6:00 – 8:30 p.m. at CCE-Albany Cty. 24 Martin Road, Voorheesville, NY. Helping your farm business achieve success. Registration is $25. For more info contact Gale at 518-765-3500 or Sandy Buxton 518-380-1498 or sab22@cornell.edu. Friday, November 9, Still Time to Register for Breezie Maples Farm Tour sponsored by Cornell Cooperative Extension Schoharie and Otsego Counties. from 10 a.m. to 2 p.m. at Breezie Maples Farm, 2269 County Hwy 34, Westford, NY. Interested in learning more about maple production or starting a maple farm business? Register now at 607-547-2536 or otsego@cornell.edu. Space is limited, for a maple farm and sugarbush tour – The event will include a tour of the farm followed by a discussion on marketing opportunities for maple operations. Participants are asked to bring a bag lunch. The event fee is $10 per person. Our host, Breezie Maples Farm, is one of the largest producer of certified organic maple syrup in New York State and offers a range of other specialty maple products. November 12-14, 2012 Penn State Dairy Cattle Nutrition Conference at Holiday Inn, Grantville, PA. Registration fee required. For more information contact Coleen Jones at 540-997-5809 or cmj11@psu.edu . A pre-conference symposium will discuss how to identify bottlenecks to performance. Regular meeting will delve into trace mineral supplementation’s impact on management parameters, along with hot topics in the world of silage and transition cow performance. Thursday, November 15th, 2012 Webinar 3: Management practices to reduce P-Cap: at 3:00pm. Dr. Meg McGrath, plant pathologist at Cornell University’s LI Research Center and Dr. Chris Smart, plant pathologist at Cornell University’s Geneva Experiment Station will explain long term strategies for staying P. capsici free and reducing the problems on your farm. You can also access the webinar from your home computer. All certified pesticide applicators that attend this final webinar are eligible for 1.25 credits towards recertification in categories 1A, 10, 22 and 23. To register, visit http://cdvsfp.cce.cornell.edu/. The cost is $10/farm operation. If you have any questions regarding the program, please lgm4@cornell.eduor call the county office that is hosting the event. Nov. 15, 2012 4th Annual Cover Crop Tour and Workshop, at the USDA NRCS Big Flats Plant Materials Center. For additional information contact paul.salon@ny.usda.gov or by calling 607-562-8404. There will be a morning field tour. Let us know if you have special needs. Please bring $10.00 to cover the cost of lunch. 4.00 CCA credits available Registration will start at 9:15am, and the field tour begins at 9:45am. There may be a (to be confirmed) demonstration of an innovative, no-till inter-row cover crop seeder from Penn. State. Supported by an NRCS Conservation Innovation Grant. As in the year’s past, we will have a morning tour at the Plant Materials Center, 3266 State Route 352, Big Flats, NY, and then travel to the Big Flats Community Center, immediately after. Hosted by the USDA-NRCS Plant Materials Program in cooperation with the Upper Susquehanna Coalition, Empire State Chapter Soil and Water Conservation Society and Cornell Cooperative Extension. November 15th 2012 Harvesting Opportunities: Growing Local Food Economies & Protecting Farmland. Hotel Albany, Albany, NY. For more details go to: www.farmland.org/newyork. Or call 518-581-0078. A Conference to Inspire and Educate New Yorkers to Support Agriculture, Strengthen Local Farm and Food Economies and Get Involved in Protecting Farmland. Keynote Speaker: Verlyn Klinkenborg, author The Rural Life and Making Hay. This conference will bring together farmers, public officials, land trusts and local food and public health leaders to take a serious look at the potential to grow New York’s economy by strengthening connections between farmers and local consumers and protecting our state’s irreplaceable farmland. November 19, 2012 Webinar – Diagnosing Problems in Nutrition Programs through Records. Presented by Greg Bethard, North Carolina State University. Webinar will commence at 1:00 p.m. Eastern time. Register at http://bit.ly/Hoards-Xwebs. Saturday, December 1st, 2012 Worried about the Legacy of your Land? Attend “TIES TO THE LAND” at Hanah Mountain Resort & Country Club 576 West Hubbell Road, Margaretville, NY 12455 from 10AM—3PM . $50 fee includes catered lunch and workshop materials. REGISTRATION—Register no later than NOVEMBER 16th. Call Catskill Forest Association for more information @ 845-586-3054. Suitable for any landowner (from 1/4 acre to 100 acres). Most landowners say they care about their forest, especially how it is passed on to future generations. However, most landowners do not have a Succession Plan. Succession planning is both emotionally & legally challenging. The differences among family members in values, goals, and lack of critical skills can lead to disaster. Required are the tools which many landowners already possess to manage their forest—passion, preparation, & planning. TIES TO THE LAND gives landowners the information to make this transition successful. Call CFA for more information @ 845-586-3054. Tickets are available on-line at http://reg.cce.cornell.edu/_225 Seating is limited. Please register by November 23. Lunch is included. We may not be able to have registration at the door. This event is brought to you by: USDA / New York State Dept. of Agriculture & Markets Specialty Crop Block Grant. The Colgate Inn in Hamilton, NY is sponsoring a Home Brew Review on the same day of the conference. Enter your beer by going to www.colgateinn.com or call 315 824-2300. December 4, 2012 Basic Farm Business Management Planning 6:00 – 8:30 p.m. at CCE-Columbia Cty. 479 Route 66, Hudson, NY. Helping your farm business achieve success. Registration is $25. For more info contact Gale at 518-765-3500 or Sandy Buxton 518-380-1498 or sab22@cornell.edu. December 3-7, 2012 Cider and Perry Production class with Cornell Cooperative Extension and NYS Ag Exp. Station, 630 W. North Street, Geneva, NY 14456. Registration for whole event is $950, or Part 1 is $400. Contact Gemma Osborne at 315-787-2248 or gro2@cornell.edu . The class is taught by world’s leading experts in cider production. December 7, 2012 Webinar – Feeding Systems for Group-Housed Calves. Presented by Mark Thomas, DVM, Countryside Veterinary Clinic. Webinar will commence at 1:00 p.m. Eastern time. Register at http://bit.ly/Hoards-Xwebs . This meeting is for industry representatives, consultants and retail dealers to provide information on Cornell field crops research and recommendations. Pre-register for the Field Crop Dealer Meeting online at http://nysaba.com/meeting_registration. There is a $15 registration fee for the meeting. 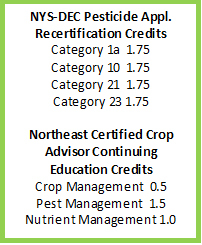 DEC pesticide applicator credits and CCA continuing education credits will be requested. A tentative agenda for the 2012 Field Crop Dealer Meeting can be found at: http://fieldcrops.org/Calendar/Documents/2012%20FCDM%20Agenda.pdf. Please contact Mary McKellar at mem40@cornell.edu if you have any questions. Tuesday, December 18, 2012 Cornell’s Agri-Business Outlook Conference at Statler Ballroom, Ithaca, NY. For more info contact: Carol Thomson at 607-255-5464 or cmt8@cornell.edu. .
current Be Green license agreement with the NYSDEC. Registration required. For more information contact Chuck Schmitt at cds34@cornell.edu and 518-765-3513 or David Chinery at dhc3@cornell.edu and 518-272-4210. Invitation to exhibit at Times Union Pride of NY Harvest Fest. The Capital-Saratoga is looking to link your farm website to theirs. The region is also promoting “Gifts Grown Here” concept too. Some promotion will be done for local Christmas tree growers as well. A FREE Farm workshop will be held by the Lewis County Soil & Water Conservation District. Join us to learn about conservation practices that can make your farm more efficient and successful while at the same time sustain natural resources for your future through our local Agricultural Environmental Management (AEM) program. Talk with other Lewis County farms about how they’ve participated in AEM and what practices have benefitted them. Soybean Seed Health, Iowa State University: a pictorial guide from Iowa State regarding microbes associated with soybean seed.